On the third day after the Crucifixion, women visiting Christ's tomb are greeted by two angels surrounded by a blazing light of celestial radiance [Luke 24:4]. The angels deliver the astonishing news of the Resurrection. Each woman reacts differently to the miraculous announcement, contemplating the profound significance of what they have heard. Working under the influence of Roman art, Rubens gives a deeply sculptural effect to this dramatic composition. Using highly rounded forms, with clear contours and rich colors, he creates a surging movement of rhythmic undulations from left to right. 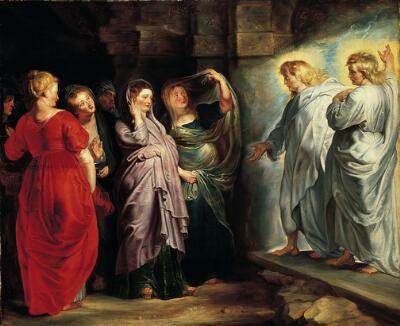 Though the exact identity of each figure has fallen into question, recent debate has convincingly suggested that the woman shielding her eyes with her veil is Mary Magdalene. The central figure is the Virgin Mary, whose form is derived directly from the Roman "Pudicitia," now in the Vatican. Possibly commisioned by a member of the Clarisse family, Antwerp ca. 1617. Czernin Collection, Vienna (on loan to Residenzgalerie, Salzburg from 1955-1971). “On the first day of the week… the women… went to the tomb… but when they entered, they did not find the body of the Lord Jesus… Suddenly two men in clothes that gleamed like lightning stood beside them. In their fright the women bowed down with their faces to the ground, but the men said to them, 'Why do you look for the living among the dead? He is not here; he has risen! Remember how he told you: …The Son of Man must be delivered into the hands of sinful men, be crucified and on the third day be raised again.'" This is how the apostle Luke described the dramatic discovery of Christ’s Resurrection, depicted here by the Flemish master Peter Paul Rubens. Notice how each woman reacts differently to the miraculous news. At the center, the Virgin Mary, tears streaming down her face, clasps her mauve shawl about her… while at the right, the repentant sinner Mary Magdalene shields her eyes with her veil. The vivid colors and theatrical gestures here suggest the influence of contemporary Italian painting. In fact, Rubens painted this panel shortly after returning from Rome, where he had studied the art of classical antiquity. The figures’ rounded forms and clean contours also recall ancient reliefs and statuary, which Rubens collected and displayed to great acclaim at his house in Antwerp.